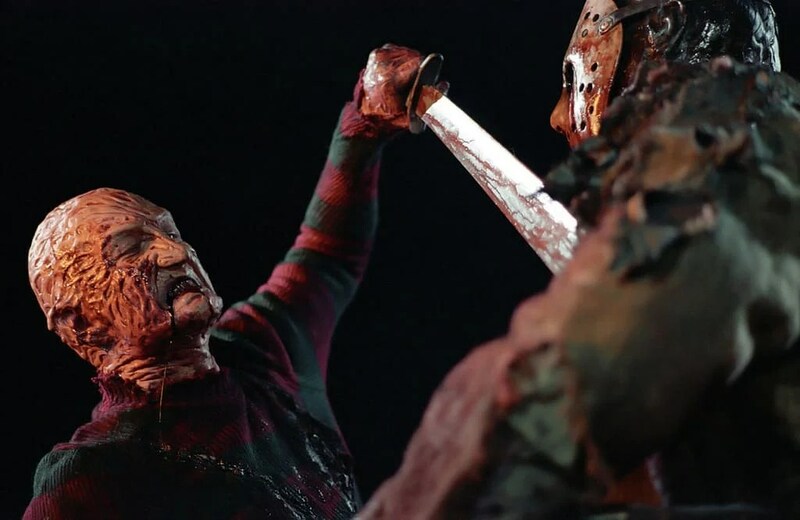 If there’s one crossover that horror fans always wanted, it was to see Freddy Krueger – of Nightmare on Elm Street fame – and Jason Voorhees – of Friday the 13th fame – square off against each other. Sure, Evil Dead’s Ash, Hellraiser’s Pinhead and Halloween’s Michael Myers would have been nice, but if you grew up in the renaissance era of slasher horror movies then you couldn’t help but be a Freddy and Jason fan. So when New Line, the film studio “that Freddy built”, acquired the rights to the Friday the 13th series it finally seemed like the fans would get exactly what they wanted. But did it live up to expectations, and does it still hold up? It’s been four years since the events of Freddy’s Dead and those wacky adults of Springwood have been pretty smart: they’ve suppressed the local kids’ dreams, making them forget about the Gloved One and thus robbing him of all power. However, Freddy’s a smart guy and easily dupes dormant moronic killer Jason Voorhees into visiting Elm Street – thus raising the local fear levels. Once the kids are terrified enough, Freddy can get back to full strength and get back to business. After Jason bloodily disposes of a generic teenage d-bag, the cops think that Freddy’s back on the hunt and our heroine Lori starts having nightmares. While Jason slowly racks up a respectable body count, Lori’s ex-boyfriend Will and his best friend escape from Westin Hills mental asylum… which is where all the kids who dream of Freddy are sent for drug treatments. At school, Lori starts spreading fear of Freddy amongst her friends. However, this new threat doesn’t stop them from going to a rave in a cornfield because, you know, kids. There, Lori hooks up with Will. Jason shows up too and quickly shows the town kids how a machete works. While Freddy’s been on the sidelines so far, this latest attack finally gives him the power boost he needs to start creating his nightmares. The kids figure out that they should get some Hypnocil, the drug that’s available at Westin Hills, so that they can stop dreaming. Their plan backfires when Freddy causes one of the kids to inject it into Jason Voorhees, because by this stage Freddy’s pissed off that the hockey mask-wearing psycho is getting too much credit. 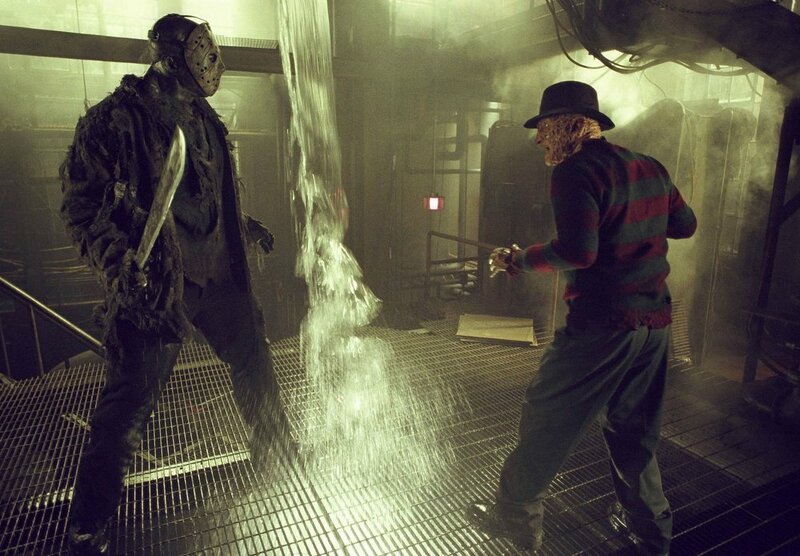 In the dream world, Freddy kicks seven colours of crap out the Masked One and reveals his plan to the dope. Those pesky kids know there’s a battle brewing, so they revive Jason at Camp Crystal Lake so he’s got the home field advantage in fighting Freddy. For a while the two tag-team up to kill some kids before finally turning on each other. Jason’s strong but slow, Freddy’s quicker but less devastating… and you can see where it’s going. This is a great film, but one with lots of flaws. For every sneaky and smart reference to the franchise films of both characters – and there are a lot – this is a hybrid that doesn’t really fit either of them. More than that, it isn’t even a horror film by the standards of the time. It isn’t scary, it’s more like a comedic gorefest that goes through the slasher film clichés almost as a parody. Also, it suffers the same as many franchise crossovers for not delivering a proper conclusion. Freddy and Jason’s fans wanted a total victory to see who’s best, but predictably that doesn’t happen. But damn, is it still fun! The Elm Street films have always had more intelligence and imagination, and thankfully it follows that route. Yes, there are lots of dopey kids for Jason to carve up in Friday the 13th style, but the storylines of Hypnocil and Springwood struggling to figure out how to handle the Freddy situation is classic Elm Street. In general, though, some of the kids are a little smarter than the type you’d find hanging out at Camp Crystal Lake. Meanwhile, director Ronnie Yu shows his flair during the dream sequences and, for twisted jokes and buckets of blood, it’s priceless. Freddy fans might despair of him being mostly ineffectual for the first third of the film, but Jason gets to do what he does best and it’s always a treat. Once Freddy gets going he’s in great form too, cruelly taunting Jason who, after all, is just another kid deep down. Once the fight hits the real world, he still proves a handful for Jason and it’s a surprisingly competitive match-up. Is it everything the fans wanted? Not quite. But it’s pretty damn close, and a bloody great amount of fun.